← Exclusive NEW Rooted Color Wigs Are Here! 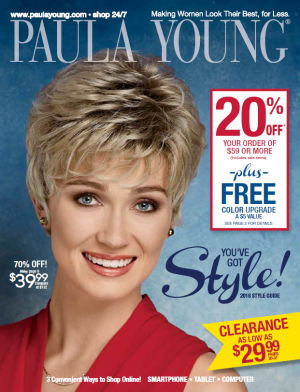 For decades, Paula Young has made every day a great hair day for millions of satisfied women! Check out our vast selection of wigs for sale online at PaulaYoung.com. There you’ll find online wigs in cuts, colors, and styles that are perfect for you…and your budget! From sleek straight wigs to romantic wavy wigs to bouncy curly wigs, Paula Young has online wigs to flatter every face shape and to make you look your best and feel the most confident. Whether easy-care, shake-n-go kanekalon synthetic or heat-stylable 100% real human hair, whether natural-looking lace front wigs or monofilament wigs, Paula Young has wigs for sale online in the best wig fibers and constructions available at the best prices for online wigs…150% guaranteed! This entry was posted in Hair trends and tagged Kanekalon, Online Wigs, Paula Young Lace Front Wigs, Paula Young Wigs for Women, Straight Wigs, Wigs for Sale Online. Bookmark the permalink.